When the General Conference Session in Toronto considers proposed changes in our Church Manual‘s statements on divorce and remarriage, the delegates will be continuing a process that began many decades ago. From the middle of the 19th century until the present, Seventh-day Adventists have sought to apply the principles of Scripture to heart-rending problems encountered when marriages fail. Gradually, we have enunciated and revised policies with the goal of being true to the Gospel and guided by God’s Spirit. Pastors seeking to minister to divorced persons in the church may benefit from a brief sketch of the major steps that have led our church to its current policy. From the earliest beginnings of our organized work, Seventh-day Adventists have found it necessary to consider our response to divorce and remarriage. For example, one of the first questions raised at the 1862 Michigan State Conference was this: “How shall we treat divorced marriages?”(1) The questioner was a Brother Sanborn who needed an answer to a practical question. Should we accept into fellowship individuals who had become divorced without “biblical justification” and were later remarried? The difficult query was referred to the Conference committee for further consideration. There exists, however, no record of any subsequent action. So we cannot be certain what answer Brother Sanborn received during these early years. Thus, from early years onward, new members have generally been welcomed without blame for past marital difficulties. However, discipline for those who are already church members when their marriages falter has been the occasion for far more difficulty. The concern of the church has been to maintain the highest possible standards of marital permanence and fidelity for its members, while also acting with grace and forgiveness toward those who stumble. What, then, should be the church’s response to members whose marriages end in divorce? Should they be permitted to continue church membership even if the reasons for the divorce are not considered to be biblical? If such individuals marry again, should they be removed from membership? And, if so, may they ever be readmitted to membership while the second marriage continues? Official answers to such questions have emerged gradually. One early attempt to generate an official policy arrived at the General Conference Session of 1879. (4) A committee had been asked to address the “subject of unhappy marriages.” In its report, the committee noted that there was an “alarming tendency” in the general public toward lax views of marriage; legal divorces were being granted by courts for flimsy reasons; and the church had the responsibility to “stay the tide of corruption” that was sweeping the country. The committee proposed three resolutions to accomplish its goals. The first stated that the only biblical cause for divorce is the commission of adultery “by one or the other of the parties to the marriage contract.” The second proposed a rule that would forbid churches from accepting into membership anyone who had been divorced for reasons other than adultery and subsequently remarried. This refusal of membership was to remain “during the lifetime of the person from whom such individual was improperly divorced.” (It is noteworthy that this second resolution would have had the effect of nullifying the already established practice of allowing such new members into the church.) The third resolution proposed that the cases of all current members, living in questionable second marriages, be “dealt with” only after the local church sought advice from the General Conference Committee or at least the local conference committee. The first of these resolutions passed unanimously. But the second and third resolutions created dissent, and the leaders withheld a decision “till after the most mature deliberation.” The record indicates that both James and Ellen White participated in the discussions. And on the third day, all three resolutions, including the first one that had already passed, were tabled permanently. Although we have no record of what the various participants said, it is clear that our leaders did not come to agreement on the proposed resolutions. RESOLVED, That we express our deprecation of this great evil, and instruct our ministers not to unite in marriage any parties so divorced. This resolution made official what was surely the consensus of Adventists at the time: only adultery was “grounds” for divorce and remarriage. To this was added one of the first official rules regarding second marriages, namely, that Seventh-day Adventist ministers should not perform weddings for people entering second marriages without biblical justification. Still, through her books, articles, and letters to individuals, Ellen White did influence the general direction of the church’s practices regarding divorce and remarriage. (7) While consistently calling for high moral standards in marriage, and while condemning the sin of adultery, Ellen White often worked to rehabilitate those who had erred. (8) She saw no light in breaking up a second marriage, even though the circumstances that led to the marriage were not exemplary. (9) She expressed grace and compassion for those injured by divorce. A decade after Ellen White’s death, Seventh-day Adventists still had very little in the way of official policy on divorce and remarriage. As the church grew both in size and complexity of organization, there was greater need felt for such policy. In 1932, the church developed the first Church Manual. Among its provisions was a section on divorce. (12) It repeated the action of the 1925 Autumn Council, and added a number of other elements, most of which have continued in subsequent statements of policy. The 1932 statement called for efforts to effect reconciliation when marriages were under threat. But sin must not be glossed over, and the “church must administer discipline in the maintenance of a high standard of moral purity and integrity.” Adventist ministers were forbidden to perform marriage ceremonies for persons who had been divorced without “Scriptural grounds.” Following Ellen White’s comments on the words of Jesus’ Sermon on the Mount, the policy interpreted biblical grounds for divorce and remarriage in terms of “fornication.” The policy stated that members should not be permitted to continue in church fellowship if they remarried while their former spouses, whom they divorced without biblical reasons, were still alive. However, the “innocent party” to a divorce did have the “right” to remarry. It was the responsibility of the officiating minister to determine whether or not a person had the right to remarry, based on “satisfactory evidence of the facts of the case.” If in doubt, the minister was to seek counsel from the local conference officers. So, for the first time in 1932, Seventh-day Adventists adopted a policy that was considered binding on all church members. And in broad outline, the 1932 policy, with its distinction between guilty and innocent parties, its emphasis on rights to remarriage for the innocent but not the guilty, and its provision for excluding guilty remarried persons from membership, has served as the template for subsequent church policy. The 1942 statement stands at summit of stringency. For the most part, subsequent revisions have had a moderating effect. Already in 1946, for example, the delegates to the General Conference Session revised the Church Manual. No longer would it be required to disfellowship all adulterers. Those who confessed their misdeeds and were deeply repentant could be placed under censure for a stipulated period of time. Nor would rebaptism be required for all such erring ones. In all these provisions, the 1950 changes and additions served primarily to clarify and extend previous policies. But the most noteworthy change in 1950 was the new provision for readmitting members who had been disfellowshipped for errant remarriages. The Manual notes that circumstances of such second marriages may be complicated in many ways. For example, the welfare of children might be at stake. Then the Manual stated: “In a case where any endeavor by a genuinely repentant offender to bring his marital status into line with the divine ideal presents apparently insuperable problems, his (or her) plea for readmittance shall before final action is taken be brought by the church through the pastor or district leader to the conference for counsel and recommendation as to any possible steps that the repentant one, or ones, may take to secure readmittance.” If such a one was readmitted to the church, the policy insisted on rebaptism. And the policy said that the readmitted member should not hold leadership positions in the church, especially positions requiring ordination. This provision for readmission to membership was the source of considerable discussion in subsequent years. What, for example, would it mean for a remarried person to “bring his marital status into line with the divine ideal”? Is the implication that he or she should divorce a second time? And what should be counted as “insuperable problems” which would lead the church to grant mercy to those in second marriages? How long must such people wait before being readmitted to membership? Once readmitted, what positions of leadership, if any, should be open to such people? The most recent revisions of church policy occurred at the 1995 General Conference Session. At that time, the broadened definition of “fornication” was approved for inclusion in the Church Manual. (17) The wording of the Manual was also clarified regarding those, who for reasons of safety, find it necessary to seek legal separation or divorce. The revised language makes it clearer that such members need not be censured for their actions. Finally, the 1995 General Conference Session voted to establish a study commission to give thorough reconsideration to the subject of divorce and remarriage and to make appropriate recommendations for changes in the Church Manual. The prescribed commission completed its work in 1999. Its final report to the Administrative Committee of the General Conference, which was later circulated among members of the General Conference Committee at the Annual Council of 1999, called for fuller statement of biblical principles regarding marriage and care of members who experience divorce and remarriage. 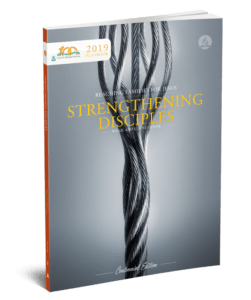 Some of the commission’s work has been incorporated in the proposed changes in the Church Manual that will receive consideration at the 2000 General Conference Session in Toronto. The ongoing discussion of how our church should best treat the matter of divorce and remarriage is evidence that we desire to take seriously the principles of the Bible and the guidance of the Holy Spirit. We should not be surprised that the church has struggled with these matters from its inception. When we consider the complexities of marital relationships, the potential for harm when things go wrong, the desire of the church to protect high standards of moral conduct, and the conviction that we should treat our erring members with grace, we should expect to need God’s ongoing guidance. Let us hope and pray that the meetings in Toronto will represent a further step toward maturity of understanding God’s will and God’s grace. (1) Joseph Bates, “Business Proceedings of the Michigan State Conference,” Review and Herald, October 14, 1862, p. 157. (2) Uriah Smith, “Divorce and Marriage,” Review and Herald, Feb. 8, 1887, p. 89. (3) The Annual Council of the General Conference Committee, General Actions, October 13-21, 1976, Washington, D.C.
(4) The record of the 1879 meeting, at which divorce and remarriage were discussed, was never published. The quotations given here are from the handwritten minutes of the 1879 General Conference Session. These minutes are in the General Conference Archives. A fuller quotation of the relevant portion of the minutes can be found in the unpublished manuscript of Bert Haloviak, “Law or Compassion: SDA Approaches to Divorce, Remarriage and Church Fellowship,” presented to the General Conference Divorce and Remarriage Study Commission, meeting in Hoddeston, England, September 14-16, 1997 (available on the General Conference Archives and Statistics website: www.adventist.org/ast). The most comprehensive historical, ethical, and sociological account of Adventists’ treatment of divorce and remarriage is in Michael Pearson, Millennial Dreams and Moral Dilemmas: Seventh-day Adventism and Contemporary Ethics (Cambridge: Cambridge University Press, 1990), pp. 182-228. (5) Ellen White, Manuscript 2, 1913. (6) W.C. White, Jan. 6, 1931 quoted in Elbio Pereyra, “Marriage, Divorce, and Remarriage in the Writings of Ellen G. White,” unpublished manuscript, Ellen G. White Estate, Feb., 1987. “The Spirit of Prophecy and Adultery, Divorce, Remarriage, and Church Membership,” Manuscript release 448, August, 1975. “Dealing with Ministers and Workers Who Have Violated the Seventh Commandment,” Manuscript release 449, August, 1975. “Ellen G. White Counsels Relating to Adultery, Divorce, and Remarriage,” a compilation by Robert Olson, June, 1976. “Marriage, Divorce, and Remarriage in the Writings of Ellen G. White,” by Elbie Pereyra, Feb., 1987. “Summary of Biblical and E.G. White References to Marriage, Divorce, and Remarriage,” by Teofilo Ferreira, 1997. (8) See, for example, the accounts in Elbio Pereyra, “Marriage, Divorce, and Remarriage in the Writings of Ellen G. White.” Cited above. (9) Ellen White, Letter 175, 1901 quoted in Selected Messages, vol. 2, pp. 341-42. (10) “Actions of the Autumn Council of the General Conference Committee,” Meeting in Des Moines, Iowa, Oct., 1925. (11) On this point see B. Haloviak, p. 7 of manuscript cited above. (12) General Conference of Seventh-day Adventists, Church Manual, 1932, pp. 175-77. (13) General Conference of Seventh-day Adventists, Church Manual, 1942, pp. 187-89. (14) General Conference of Seventh-day Adventists, Church Manual, 1951, p. 240. (15) General Actions of the 1976 Annual Council of the General Conference Committee, pp. 25-33. (16) It should be noted that the 1977 Annual Council of the General Conference Committee voted to amend Appendix C of the 1976 statement, resulting in a shorter list of examples of “fornication.” The 1977 statement reads, in part, “Gross sexual perversion, including homosexual practices, are recognized as a misuse of sexual powers and a violation of the divine intention in marriage. As such they are just cause for divorce.” General Actions of the Annual Council, Oct., 1977. (17) Following the 1977 Autumn Council’s revised statement on the matter, the Church Manual of 1995 reads: “Unfaithfulness to the marriage vow has generally been seen to be adultery and/or fornication. However, the New Testament word for fornication includes certain other sexual irregularities. (I Cor. 6:9; I Tim. 1:9, 10; Rom. 1:24-27) Therefore, sexual perversions, including homosexual practices, are also recognized as a misuse of sexual powers and a violation of the divine intention in marriage. As such they are just cause for divorce.” Church Manual, 1995, p. 182. At the time he prepared this paper, Gerald Winslow was Dean of the Faculty of Religion at Loma Linda University.